New York Times bestselling, award-winning creator Bill Willingham presents a new series starring the female FABLES. 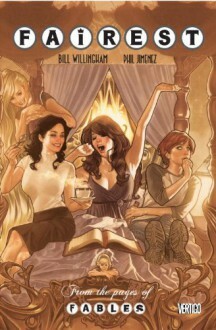 Balancing horror, humor and adventure in the FABLES tradition, FAIREST explores the secret histories of Sleeping Beauty, Rapunzel, Cinderella, The Snow Queen, Thumbelina, Snow White, Rose Red and others.The first 6-issue tale follows the misadventures of Briar Rose immediately after the events of FABLES #107(collected in Fables Volume 16: Super Team), in which she was stolen away by the goblin army. Following this first collection, Willingham will serve as a consultant on all story arcs and introduce new writers from other mediums to the FABLES mythos.Fan-favorite artist Phil Jimenez (WONDER WOMAN, THE INVISIBLES) returns to Vertigo to pencil the opening storyline. Award-winning cover artist Adam Hughes (WONDER WOMAN, BATGIRL) provides covers, starting with a wraparound cover on issue #1 that spotlights the lovely ladies who will star in the series. http://gatadelafuente.booklikes.com Danielle's Reading Adventures 4.0 True Love's Kiss? I actually really liked this one! Beautiful art (some of the best I've seen in the Fables books), and solid writing. I've been kind of bored with Fables lately, and this is the first spinoff I've really enjoyed. It got me excited about the Fables universe again. Yay. Amazing artwork. Liked the story. Sleeping Beauty was always my favorite fairy tale.